This 33.5mm. 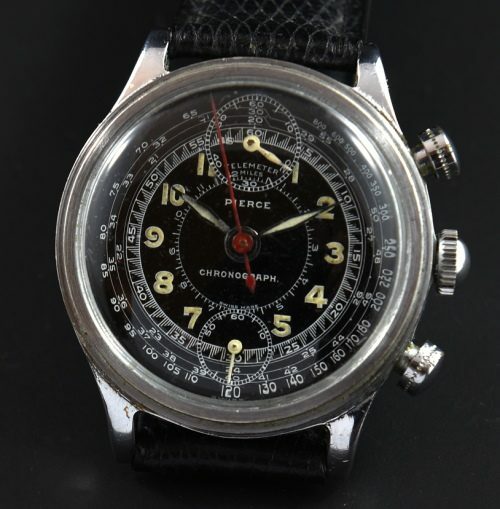 WW2 era Pierce chronograph measures 33.5mm. with a stainless steel back and chrome plated sides. The ORIGINAL black dial, hands and luminous is very well-preserved and looks striking! The up-down chronograph manual winding movement was just cleaned and is accurate, with all chronograph functions operating smoothly. I like the knurled accented chrono pushers. The entire watch looks fantastic on the wrist. It’s great to find sucha fine looking original chronograph from the 1940’s.